In a pot, add cut pieces of chicken, Progresso chicken stock, cilantro and season with salt and pepper. Cook covered for 30 minutes on medium heat. In another pot, add water and vegetables and cook covered for 20 minutes on medium-low heat, allowing the vegetables to cook without getting too soft. When the chicken is ready, remove from pot; remove skin, bones and shred. Strain the stock, add to the shredded chicken and place in a plastic-covered container and freeze. When the vegetables are ready, place them in another covered container and freeze. Save the stock where you cooked the vegetables and freeze it as well. When you’re ready to enjoy the Cuban-style ajiaco, take out the three containers from freezer and defrost. Add all ingredients into a large soup pot and cook for 15-20 minutes. You can season with salt and pepper and serve with white rice and avocado. You can use drumsticks or only chicken breasts, if you prefer. The reason why we cook the meat separate from the vegetables is to keep the veggies from getting too soft, and so they can still have a bite to them after defrosting. Recipes that you can cook now to store frozen and eat later are a wonderful idea. Sometimes I cook many meals in one day, especially when I have some extra time. This allows me to freeze them so that when I have a lot to do I can simply defrost and we won’t have to go to a restaurant or get take out. There are many simple recipes that can be kept frozen such as soups, beans, potatoes, rice and stocks. 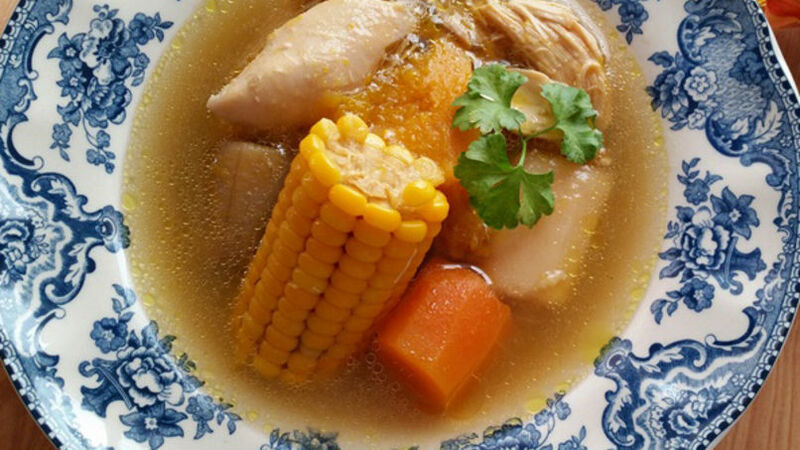 I want to share with you a great recipe for Cuban ajiaco, a rich soup made with chicken stock, chicken, plantains, carrots, corn and yucca. It’s simple and perfect for freezing. Let’s get cooking!